Shop our signed Munster memorabilia with a great selection of autographed items signed by the team players. 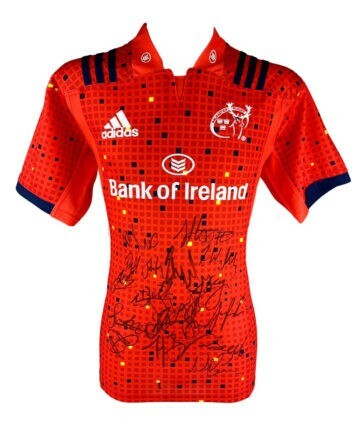 Signed Munster shirts, jerseys, rugby balls and photos! Many with signing proof and all with a certificate of authenticity, free UK delivery and fast worldwide shipping! As one of the four primary professional rugby teams in Ireland, Munster Rugby has a fierce following of loyal fans and a heritage that dates back to 1879. Over 140 years the club has represented one of the IRFU’s main branches, operating from home grounds throughout Limerick. Munster’s team motto is derived from the slogan of the MacCarthy clan – it translates as: ‘To the brave and faithful, nothing is impossible’ in English. The motto is fitting when it comes to Munster’s infallible determination and high spirits even in the face of adversity. Also known by adoring fans as The Red Army, Munster have a long history of defeating premier teams – including South Africa, Australia and New Zealand’s All Blacks in the early days. In 1995 they entered their professional era – and yet again continued to excel at every clash, finally reaching the Heineken Cup quarter-finals for the 1998-1999 season. Over the following years the trophy was always just within reach, with glimmers of hope destroyed as Munster often crashed out at semi or quarter final stages. In the 2005-2006 season they finally claimed their first ever European title, beating fierce rivals Leinster before defeating Biarritz 23-19. They won yet again in 2007-2008. Within the last decade Munster have continued to perform spectacularly in both domestic and European competitions, but still further trophies have remained just out of reach. Despite this support for the side is incredibly strong – and Munster’s fans are known to be amongst the most vocal in the sport. Whether they’re signing ‘Fields of Athenry’ or simply chanting ‘MUNSTER’ over and over, they’re ever-present at every game – a sea of scarlet on the stands. Whether you’re a life-long fan or simply want to own a slice of rugby history, you’ll find a variety of Munster signed rugby memorabilia here at Firma Stella. All 100% genuine and authentic, choose from signed shirts, rugby balls, photographs and more.